Mawson's Hut, a symbol of Australia's historic past, is one of a group of four historic hut structures and other relics associated with the 1911-1914 Australian Antarctic Expedition. Mawson's Hut has international and national significance as the only Australian example, and one of six surviving international complexes, from what is referred to as the Heroic Era of Antarctic Exploration. Cape Denison, the site of Mawson's Hut, is recognized as the windiest place on earth at sea level. On average, the daily maximum wind speed is 44 mph, and the temperature ranges from 0°C to -20°C. The site consists of four buildings: the Main Hut, Magnetograph House, Transit Hut and Absolute Magnetic Hut. The Main Hut and Magnetograph House have weathered their 100 years reasonably well. The Transit Hut and Absolute Magnetic Hut have been stabilized for conservation as "standing ruins." The first moves to conserve Mawson's Hut were made by the Australian Government's Antarctic Division in the late 1970's. A second attempt at preservation, Project Blizzard, occurred in 1984 - 1986. While these attempts did not lack enthusiasm, they had little formal conservation planning to guide their efforts. By the 1990's, public concern for the condition of Mawson's Hut increased. The first Conservation Plan for the site was formulated in 1993. A site inspection during 1996-1997 revealed a paradox— the environmental conditions were both the preserver and the potential killer of Mawson's Hut. The extreme cold made it difficult for usual organic timber threats to survive, while the snow and ice particles driven by the ferocious winds abraded the timber cladding to the point where the Hut's roof was close to failure. Repairs undertaken in 1997-1998 included fixing broken internal timber structures and re-cladding part of the roof. This saved Mawson's Hut from imminent danger but did not solve the long-term issues of snow ingress and ice removal, which were outside the scope of the 1993 Conservation Plan. The AAP Mawson's Huts Foundation, established with the support of Australian Associated Press in 1996, resolved to go further with its conservation efforts. A seminar in late 1998 aired the viewpoints of various stakeholders. An outcome of the seminar was a monitoring program, implemented in the summer of 1998 - 1999. Of particular concern was the impact ice removal within the hut would have on the huge number of historic artefacts such as timber, fabric, documents, machinery, hardware, foodstuffs and chemicals. A subsequent Conservation Management Plan established an objective to remove ice following an impact assessment process. This assessment formulated a set of decision-making criteria and thresholds such as the allowable fluctuations in relative humidity. Vinod Daniel of the Australian Museum's Research Centre for Materials and Built Environment approached CSA to design a system to monitor various environmental parameters at Mawson's Hut in 1998. In January 1999, the system was installed with the intent to operate until January 2000. Other than battery problems, the system performed flawlessly for the duration of the study. Data collected during the project demonstrated that daily temperature and humidity cycles occur only when solar radiation is significant during the summer. The interior temperature cycle lags behind the exterior by several hours and is less extreme, demonstrating the current state of the building offers some insulating effect. It was also found that consistently high RH inside the hut produces enough moisture in the internal timbers to allow biodeterioration despite the low temperatures. 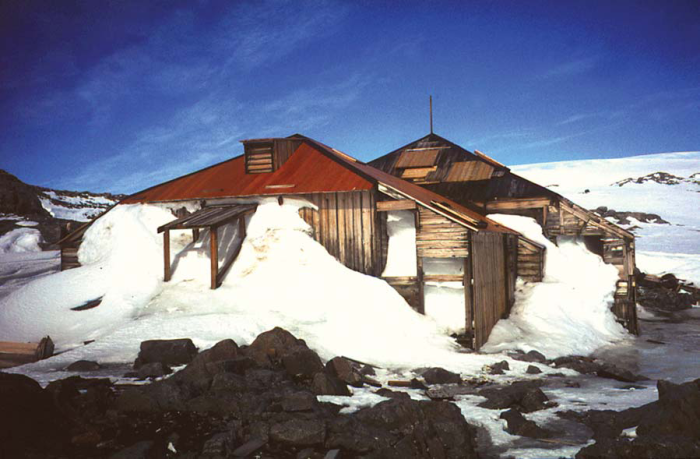 Although the monitoring system at Mawson's Hut has been idle at the site since January 2000, funding is currently being sought to recommence the project in 2002. Even under such extreme environmental conditions, Campbell Scientific products have proven to be an essential tool for pre-conservation planning and for post-project data analysis to determine the success of such treatment. A single CR10X datalogger with 2 MB of extended memory measured and controlled the historic site. The datalogger measured eight HMP45C air temperature and RH sensors, 16 thermocouples (via an AM25T thermocouple multiplexer), and a solar radiation sensor. Data was stored on a PCMCIA card that was downloaded regularly to a PC and later transmitted back to Australia via an Inmarsat Mini-M satellite phone. The project's most difficult design issue was the special consideration required for the expected -40ºC temperatures at the site. Lithium Thionyl Chloride cells from Siomar batteries were chosen to power the equipment. The HMP45Cs were given a one minute warm-up period prior to taking a measurement, and a number of steps were taken in programming the CR10X to minimize system power requirements. Acknowledgement: CSA wishes to thank Vinod Daniel of the Australian Museum, Wayne Ganther of CSIRO, Geoff Ashley of Godden Mackay Logan, Steve Martin of The State Library, NSW for material used in this document.